Plant Squalene locks-in moisture and prevents water loss. Powerful anti-inflammatories protect sensitive skin from the ageing effects of irritation. Lipid and Collagen protectors help keep the skin firm and plump. The Pai philosophy is to select breakthrough organic ingredients that work with the skin to keep it as healthy and vibrant as possible, for as long as possible. 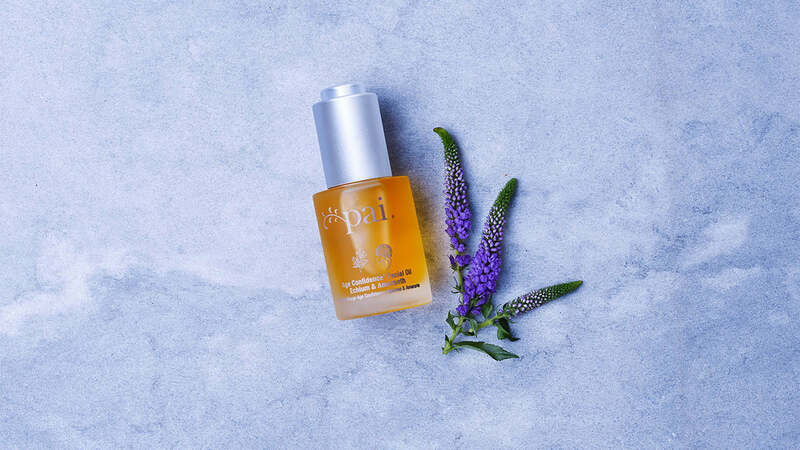 Our Age Confidence Facial Oil brings together ten Oils to deliver nutrients that naturally deplete as we age, and protect the collagen and lipids which keep skin firm. At its heart is Echium; a soothing seed extract and the richest known plant source of Stearidonic Acid and Gamma Linoleic Acid (GLA). These powerful forms of Omegas 3 & 6 help to keep sensitive skin calm and conditioned, protecting against the ageing effects of irritation. Amaranth contains Squalene, a powerful moisturising compound that depletes as we age. It works to lock-in moisture for lasting hydration that plumps the skin and softens the appearance of fine lines. Organic Rose, May Chang and Lime give our Oil a gentle but deeply relaxing scent that helps you unwind at the end of the day. At Pai, we believe beauty has no age limit. Our Age Confidence range delivers a super-charged dose of Omegas, Vitamins and Antioxidants to boost and maintain the health of sensitive skin as it ages. Balance is important for mature skin and it took a while to get the mix of oils in our Age Confidence Facial Oil right. Our experts selected a combination of fatty and 'dry' organic oils, which sink into the skin to nourish and plump with no greasy feeling. Rich in incredibly effective forms of Omegas 3 & 6 - Gamma Linolenic Acid and Stearidonic Acid, which help smooth the skin and improve the appearance of fine lines. The richest plant source of Squalene, a renowned moisturising agent that optimises skin hydration and enhances suppleness and elasticity. Massage 2-3 drops into clean skin. For optimum absorption, spritz skin with a BioAffinity Tonic of your choice beforehand. If your skin is particularly dry or mature, follow with Echium & Macadamia Replenishing Day Cream.